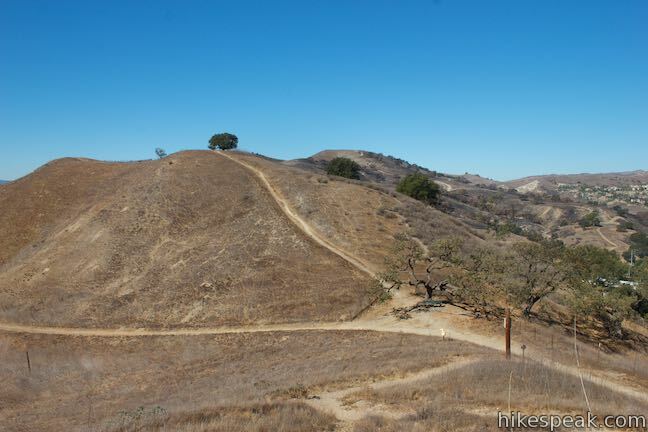 In a rolling, grassy stretch of the Santa Monica Mountains near the 101 Freeway, Anza Loop Trail plots a course through history. 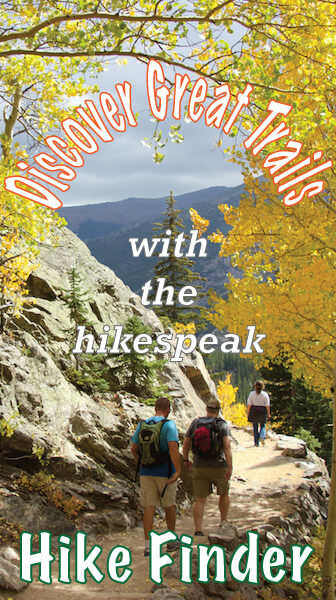 Pause along the trail to study panels and plaques about the past – or just breeze through the loop and enjoy the present sights and sounds. 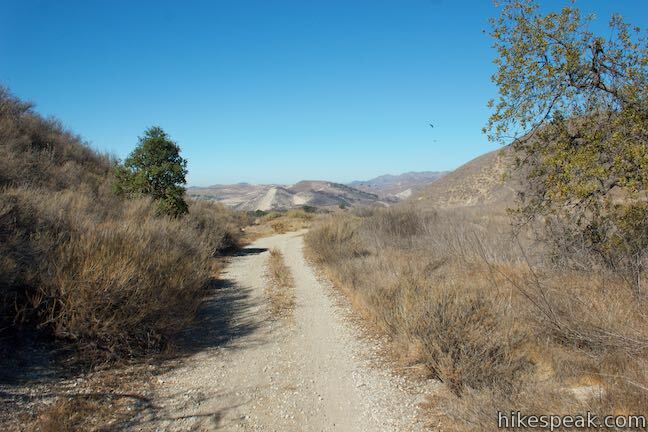 Like Anza-Borrego Desert State Park, Anza Loop Trail takes its name from Juan Bautista de Anza who led an expedition up California, solidifying a route that is now known as El Camino Real. In 1776, while history was being made on the east coast, the Spanish were creating land routes between their settlements on the west coast. 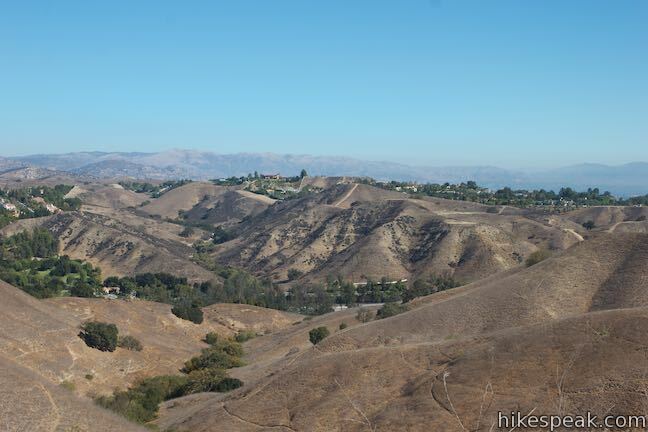 To cross between the San Fernando Valley and the Conejo Valley, Anza led a large party through the hills along Anza Loop Trail. 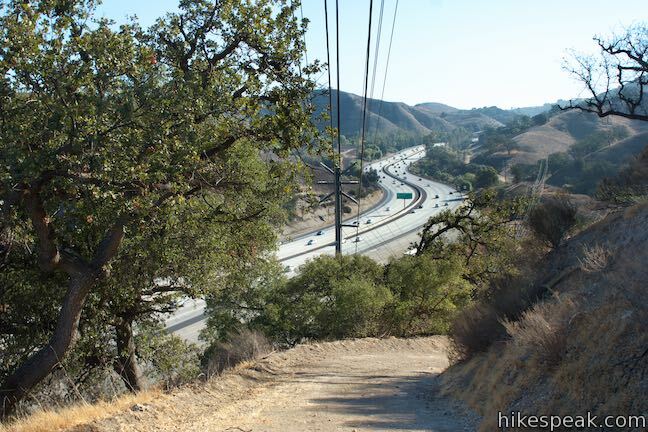 The 101 Freeway now built to the north follows the route that Anza helped establish. 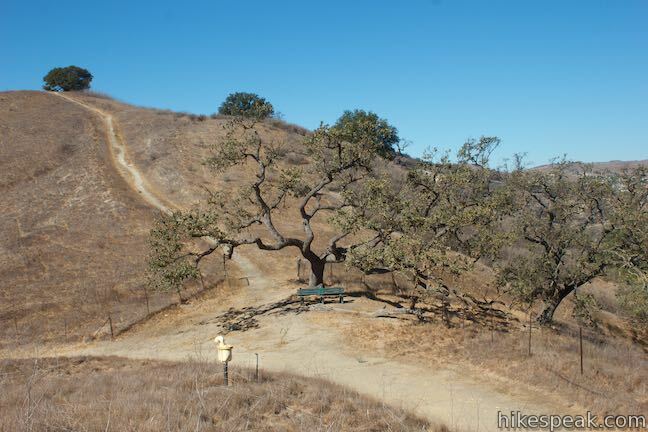 Hiking Anza Loop Trail is like picking a glass of wine. Not white or red, but stem-less or stemmed. 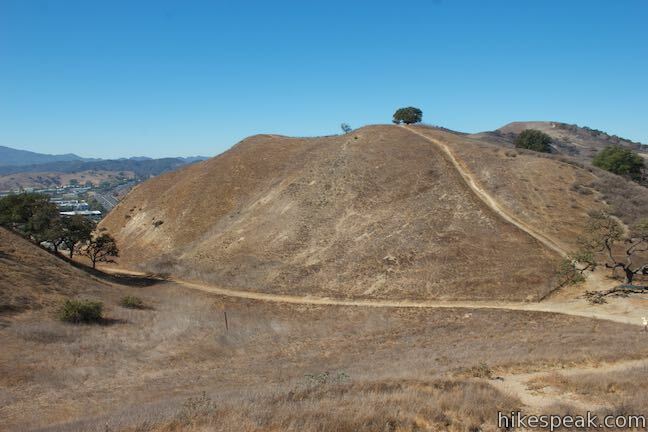 Starting from Juan Bautista de Anza West Trailhead off Las Virgenes Road creates a circuit with a stem that is 4.5 miles round trip with 535 feet of elevation change. 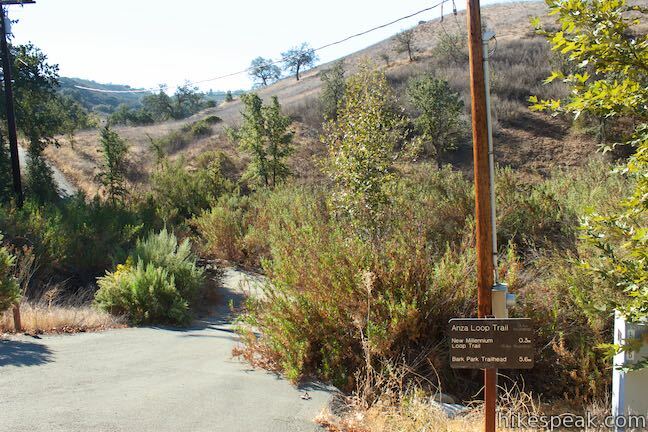 Juan Bautista de Anza East Trailhead on Calabasas Road removes the stem for a 3.8-mile round trip loop with a 510 feet of elevation between its low and high points. 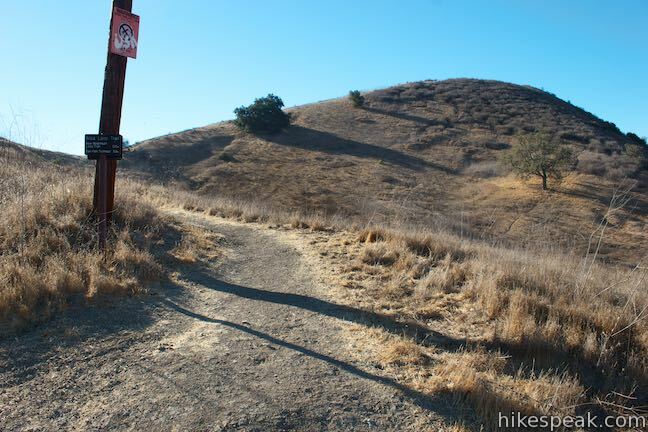 Directions for both trailheads are provided, beginning with the route from the west trailhead. 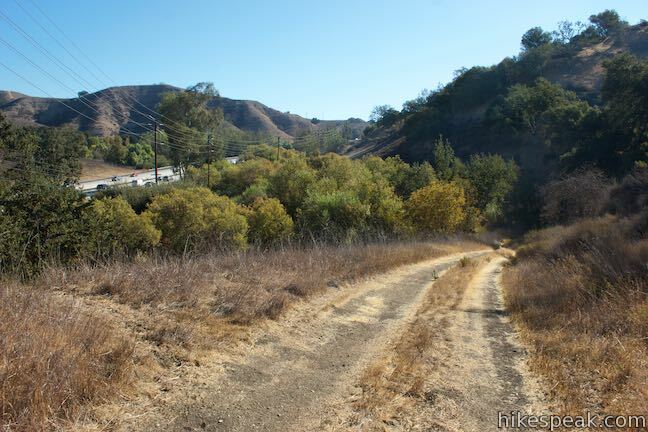 On the morning of the 15th of January 1770, the expedition led by Don Gaspar de Portola set out from a place just south of present day Westlake Village and traveled through this valley of their way to what is now Encino in the San Fernando Valley. Portola’s expedition was the first to pass through this area as the Spanish developed a land route connecting Mexico to the San Francisco Bay. Their purpose was to establish a lifeline that would secure their outposts in Alta California against Russian attempts to create colonies of their own as far south as the San Francisco Bay. Of course, Native Americans had been using this route between the valleys for centuries to travel for trade and resources. 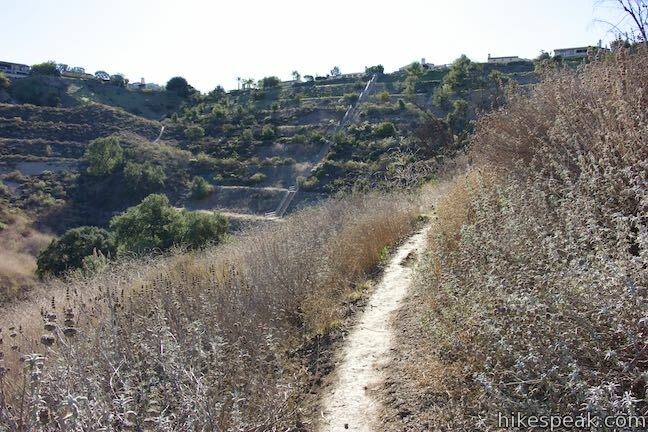 The Spanish made footpaths into roads. 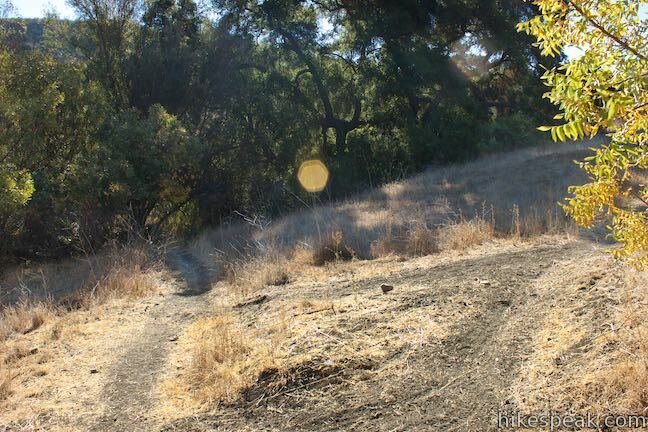 Set out east up a wide dirt trail that heads up a gap between two grass-covered ridges. 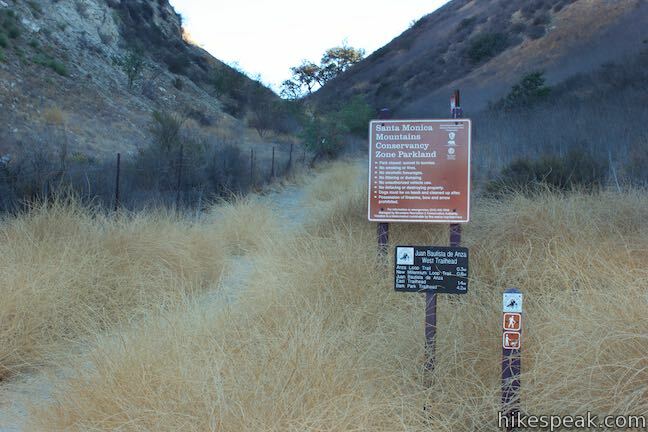 A sign notes that you are entering Santa Monica Mountains Conservancy Zone Parkland and lists the distance to Anza Loop Trail at 0.3 miles. 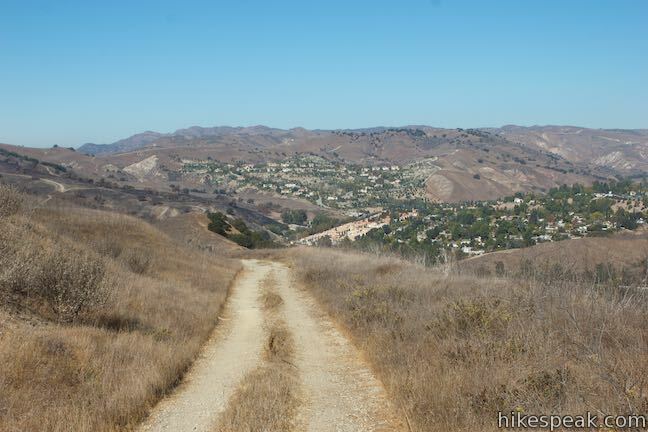 March up the trail, rising to nice over-the-shoulder views toward Agoura Hills framed by the grassy ridges. 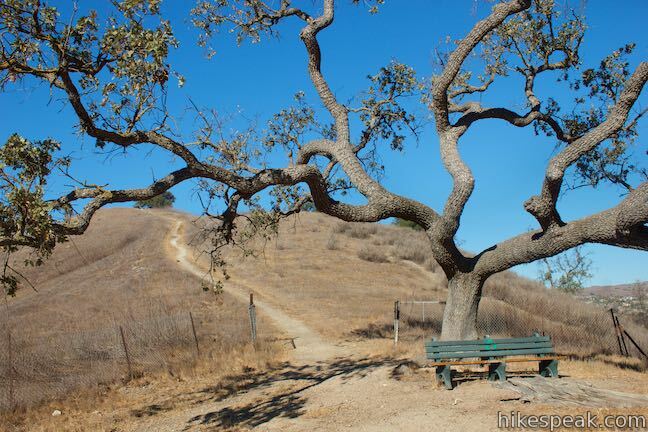 As the trail crests, pass a bench below an oak tree, where you can pause for a sit (the path to the left of the bench is not part of the loop but appears to lead to a nice perch). Just ahead, meet the junction where the loop begins. 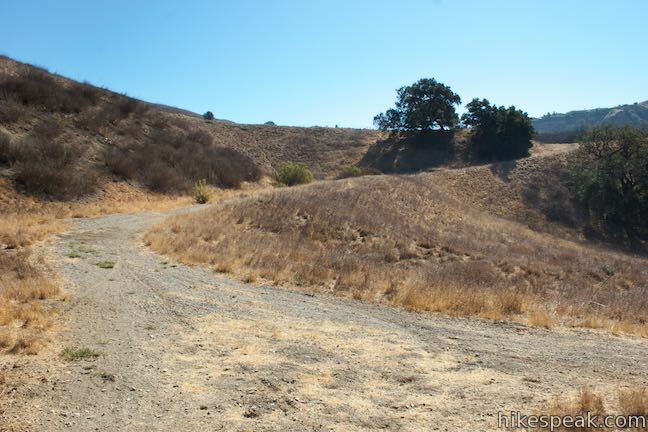 To the right, a single track branch of Anza Loop Trail rises up a grassy slope. 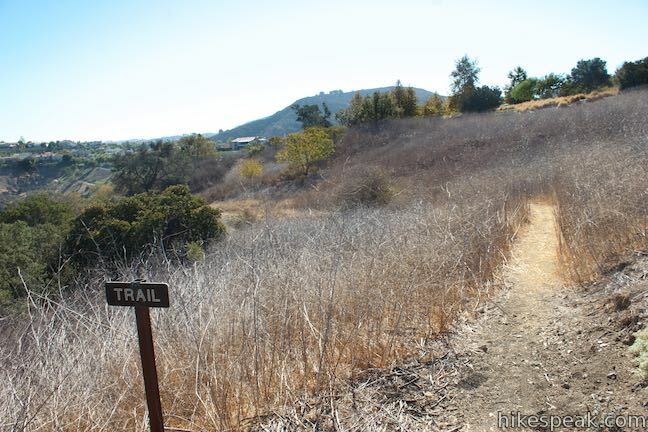 You could certainly take this path, but the directions offered here tackle the loop in a clockwise direction (this way, you’ll get to finish the loop with nice views toward Ladyface Peak). 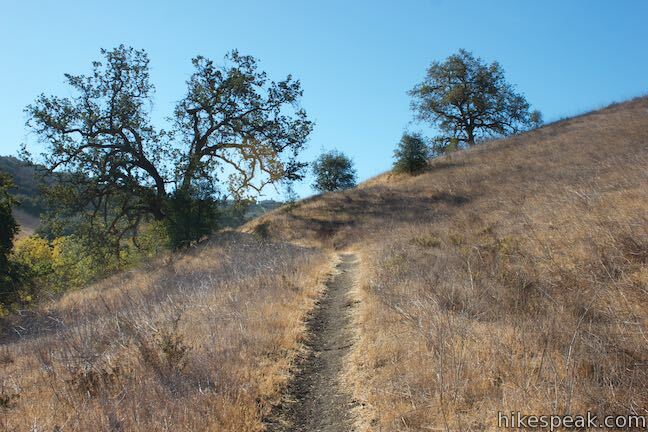 Stay to the left through the junction, proceeding on the wide dirt trail, which curves to the left and eases off the side of the ridge through a few more oaks. 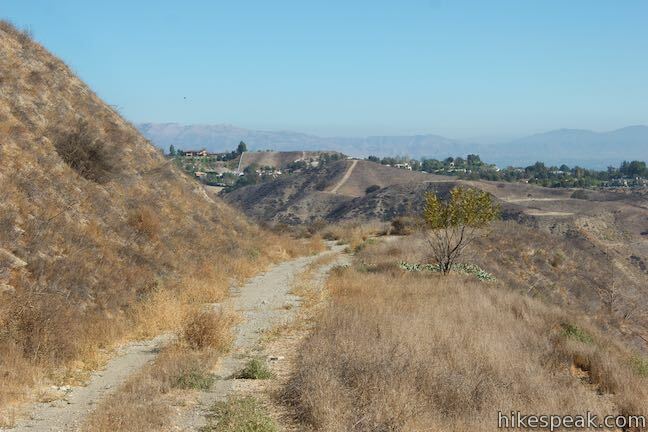 Less than a tenth of a mile past the junction, pass a plaque and a vista looking out over the 101 Freeway. 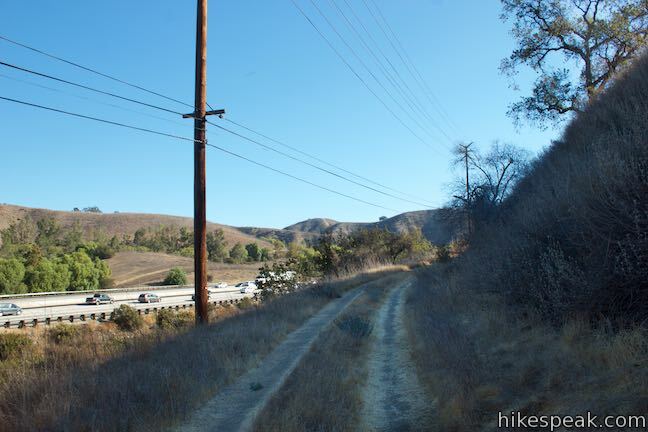 It’s time to get the “freeway-adjacent” part of the loop out of the way… Press on. In 1775, Juan Bautista de Anza was give permission by the Viceroy of New Spain to found a mission and presidio at the port of San Francisco. He enlisted soldiers with families from the area around Culiacan and other small communities on the west coast of what is now Mexico and headed north to the Mexico – California frontier. In October of that year, Anza’s expedition set out from Tubac in Sonora (now southern Arizona) to follow the trail Anza explored two years earlier. 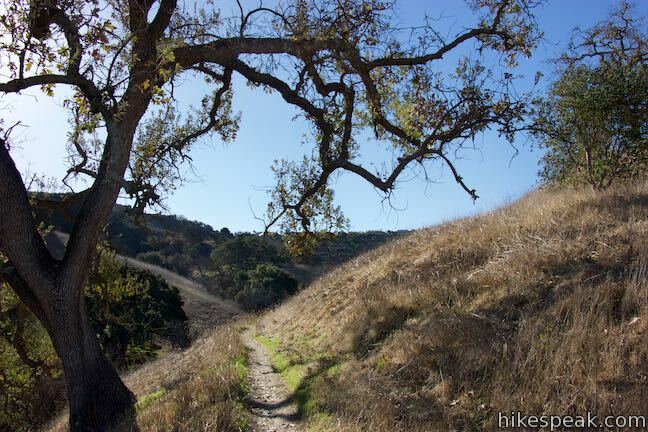 Proceed across a relatively level stretch of the trail, going through grasses beside an oak grove. 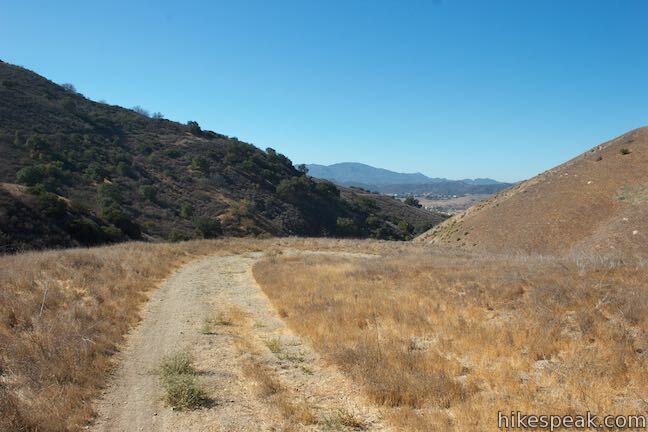 About a third of a mile after the panel describing Anza’s expedition, the trail makes an abrupt left turn and cuts across a draw in the terrain. Rise up to a double-track trail and turn right. The first mile of the hike is complete. 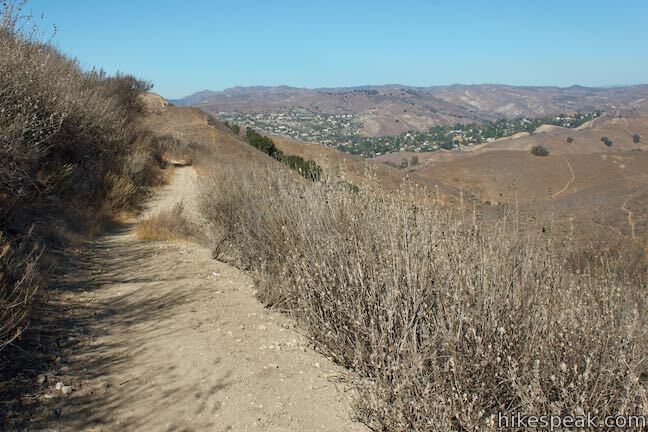 Rush your way through the next stretch of the trail, which is far closer to the freeway than any hiking trail should be. 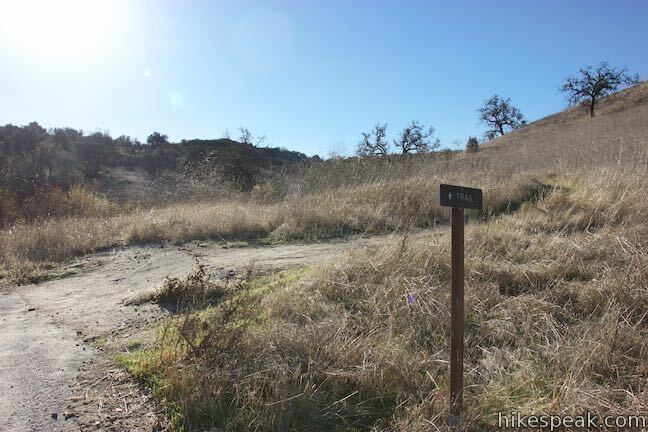 Come to a plaque honoring the site where Anza’s large expedition made camp on the 73rd night of the journey from Tubac (Arizona) to San Francisco. 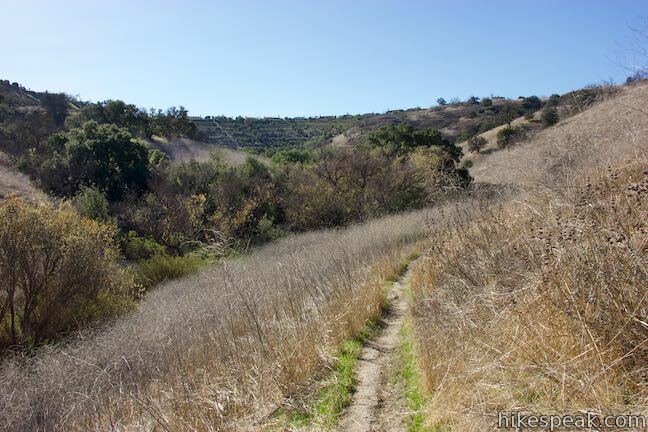 Near this spot on February 22, 1776, Juan Bautista de Anza and his expedition of approximately 200 colonists, and 100 soldiers, cowboys, and muleteers and about 1,000 head of livestock, camped on their way to settle what is now San Francisco. An expedition of that size could definitely cut a lasting trail across the land. 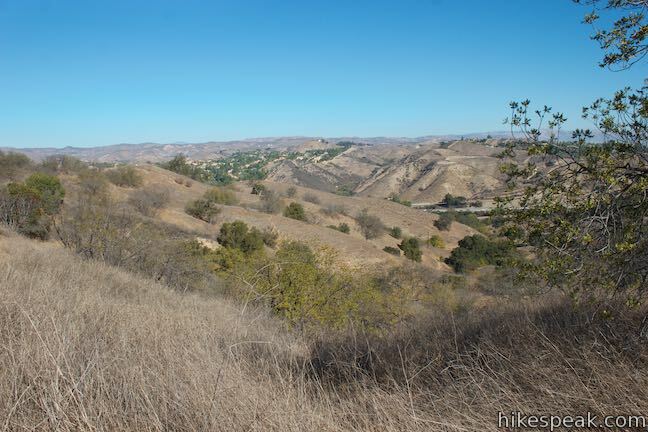 Anza’s expedition included the earliest Spanish families to settle in Alta California. 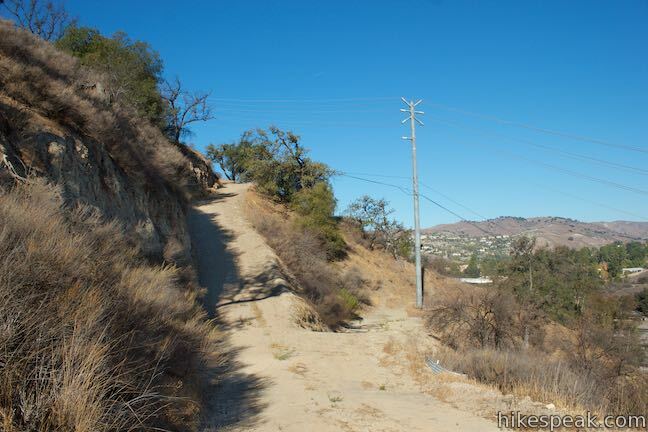 Follow this short stretch of introductory pavement as it dips across the gully and curves to the left. 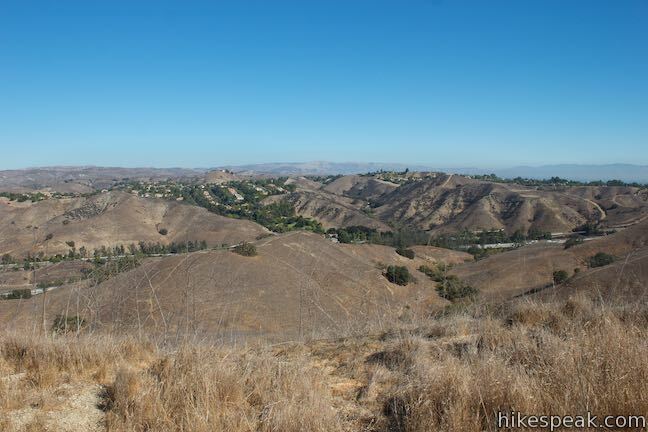 Rise to the end of the pavement, just 0.05 miles from Calabasas Road. 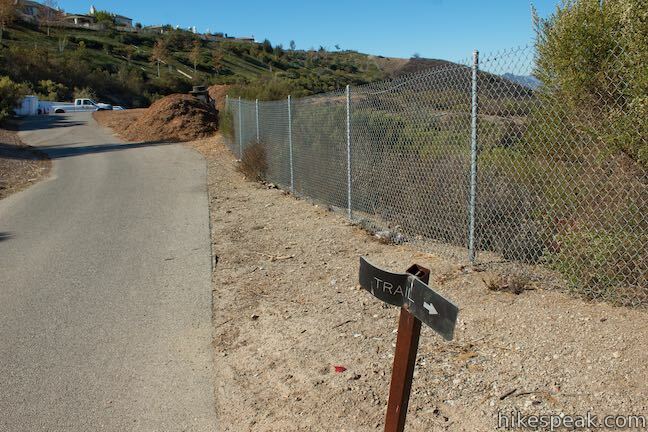 Take the dirt single-track parting to the right, next to a sign for Anza Loop Trail with a not-so-helpful directional arrow. 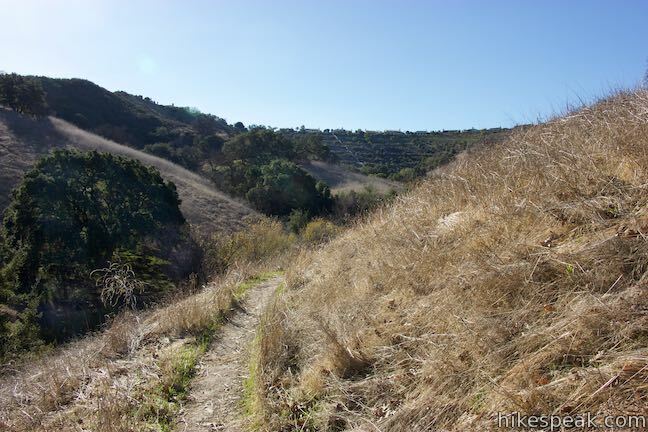 Venture south up the single-track trail, which goes gradually uphill across a grassland that slopes from right to left. Pass a solitary oak and make your way up to a second confusingly-marked junction, 0.2 miles from the start. 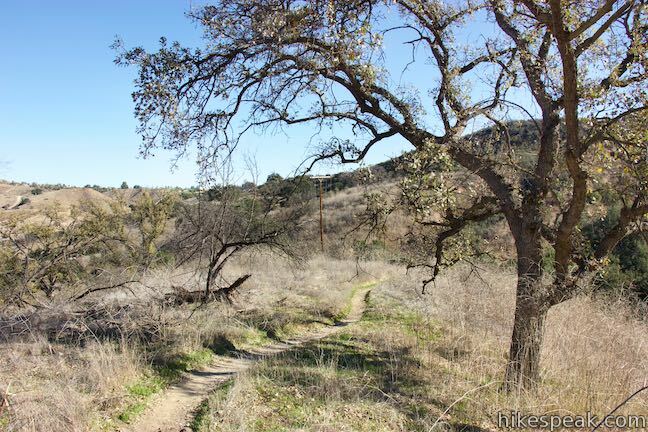 At this split in the trail, one branch drops to the left toward trees gathered in the drainage below. 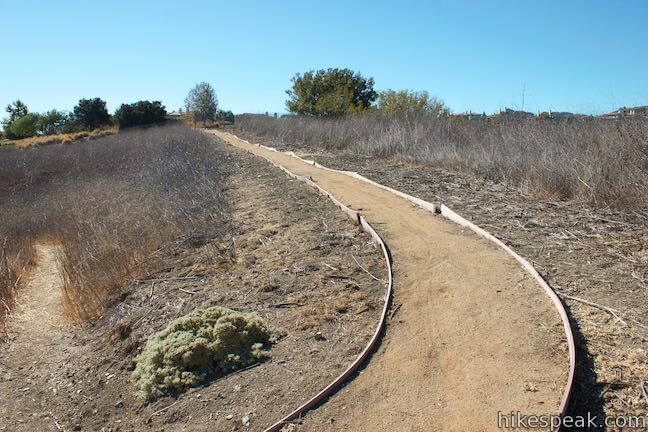 This is New Millennium Loop Trail. 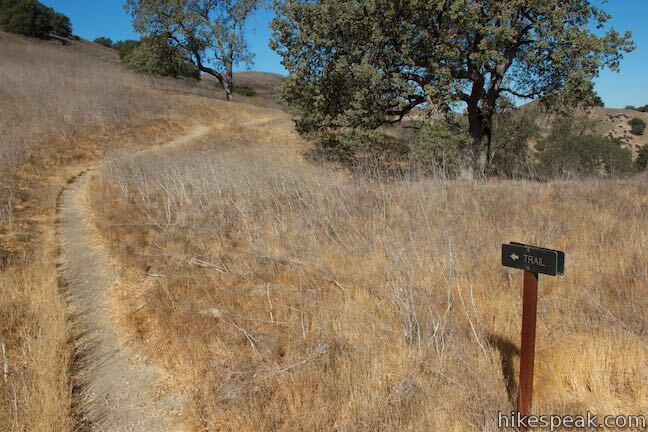 Bear right instead and proceed up Anza Loop Trail. 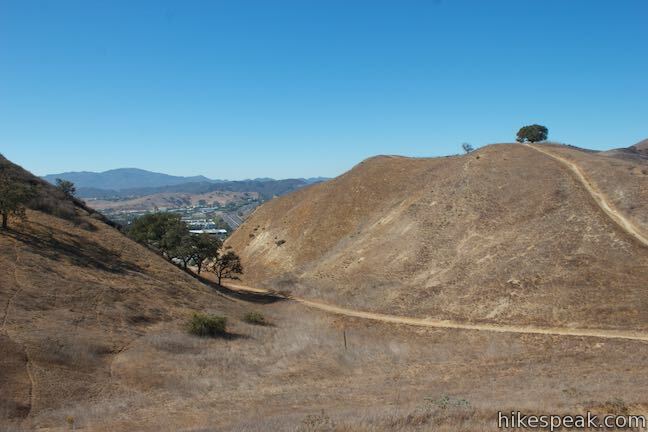 The trail weaves through creases in the grassy ridges, offering perspectives back toward the 101 Freeway and the hills beyond. 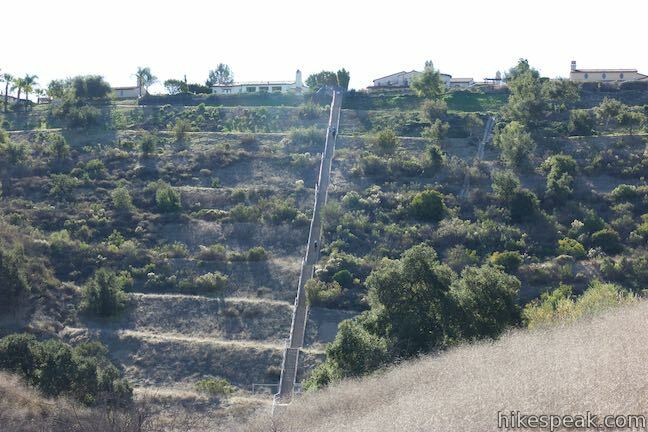 Ahead of you, a long, concrete staircase comes into view, cutting down the center of a manicured bowl that is topped by a row of houses in a neighborhood above. 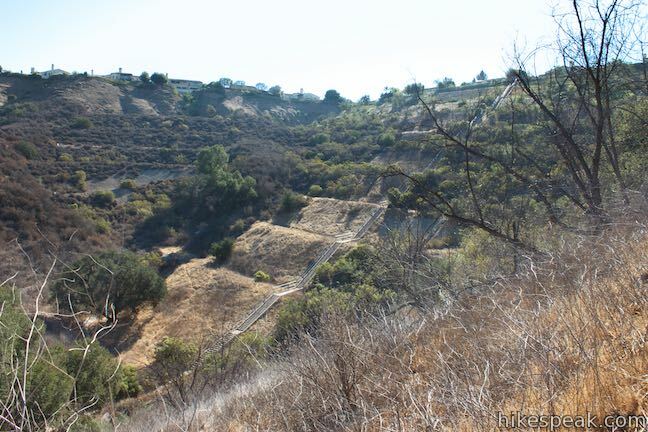 These Calabasas Stairs are a target for those looking for outdoor workouts. 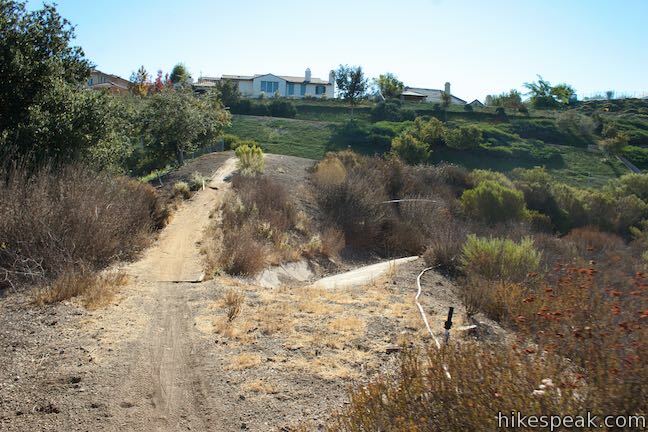 Wrap around a depression in the terrain and ascend a slope to the right of the staircase. 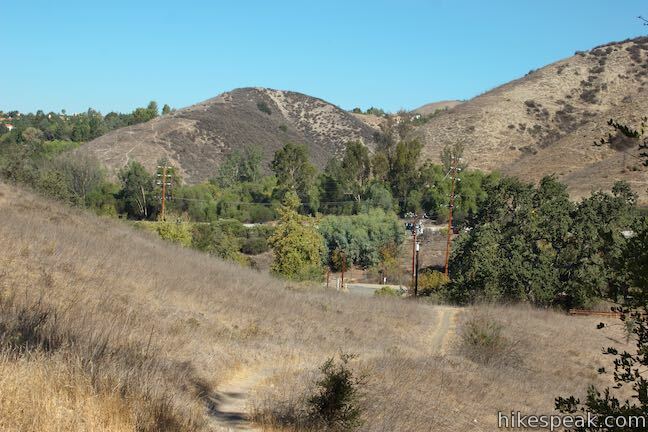 Come to an unmarked split, half a mile from Calabasas Road, where a path on the left drops to the base of the Calabasas Stairs. 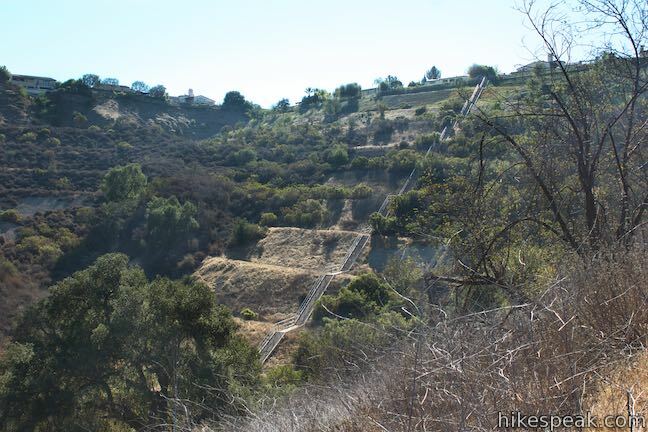 If you feel like interrupting your hike with a stair workout, by all means turn left. 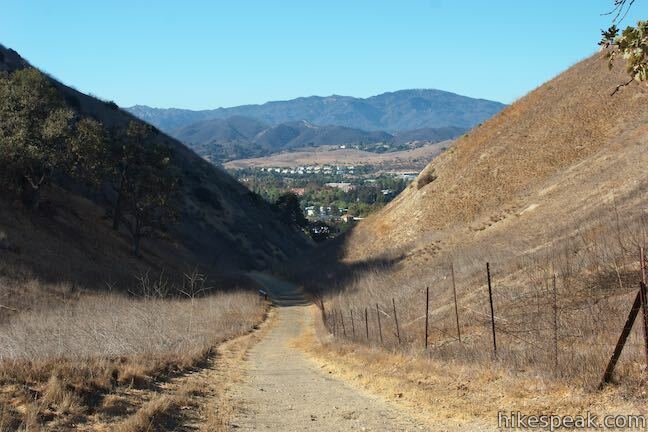 (Going down the path to the bottom of the stairs, up to the top of the stairs, back down the steps, and back up to Anza Loop Trail adds 0.4 miles to this hike.) 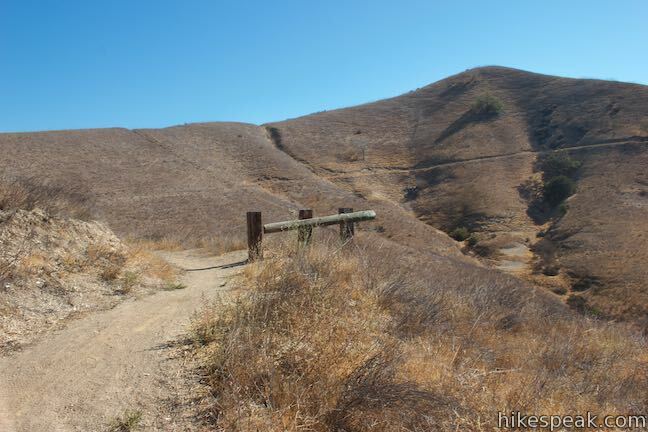 If you’re not compelled to visit the long concrete steps, tackle that elevation on a dirt trail instead and stay to the right up Anza Loop Trail. 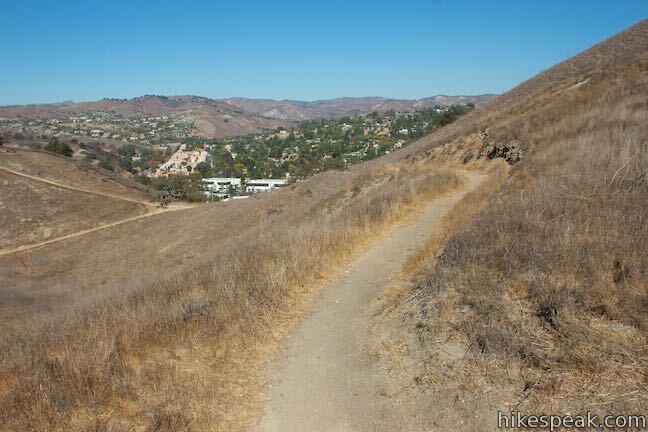 Another 250 feet up the trail, a sharp switchback to the right leads away from views of the Calabasas Stairs. 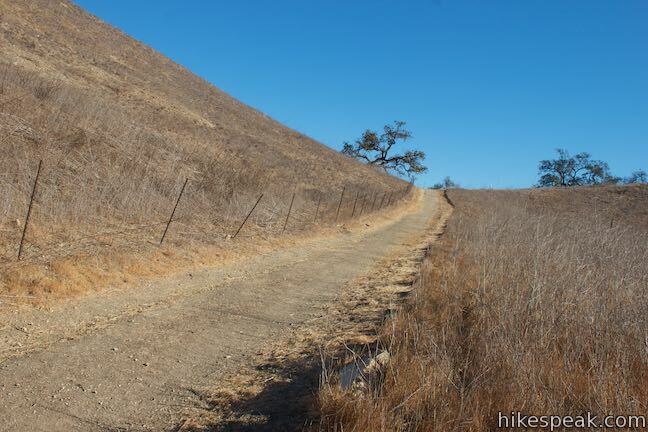 Continue through several more switchbacks on the longest ascent of the hike. 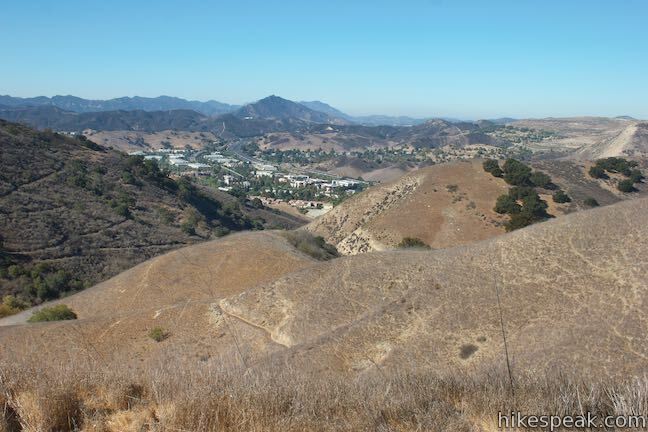 As the views expand, look northeast toward the Simi Hills, Santa Susana Mountains and the west end of the San Fernando Valley. 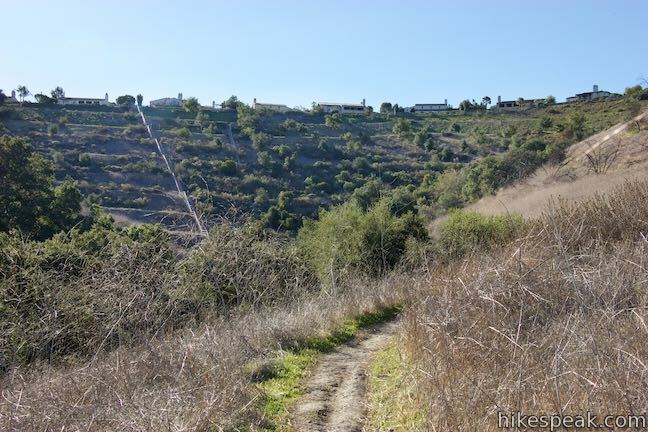 When the trail levels out, 2.45 miles from the start, go across a ridge, passing a trail on the left that rises to the end of a road in the neighborhood above. 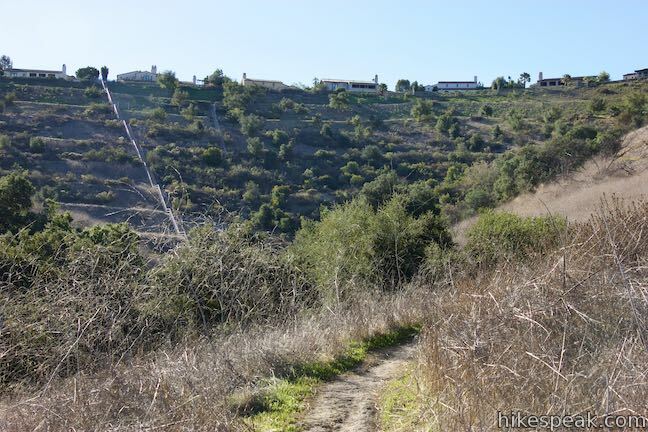 Drop across a small, pleasant ravine, briefly losing sight of the neighborhood before rising to a service road on the edge of the development. Bear right on this paved road. Fortunately, the pavement ends after 100 yards. 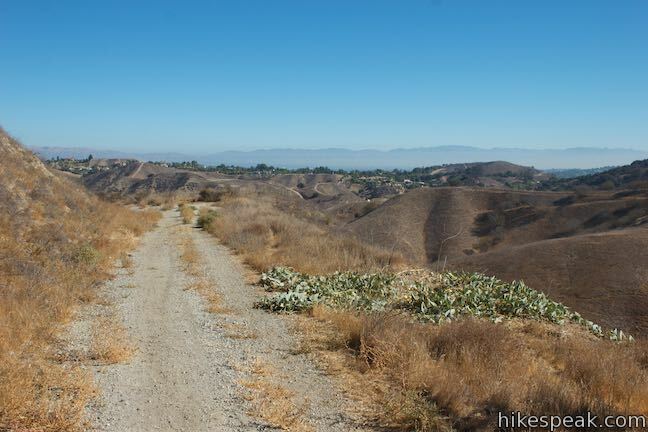 When it does, continue straight onto a wide unpaved trail. 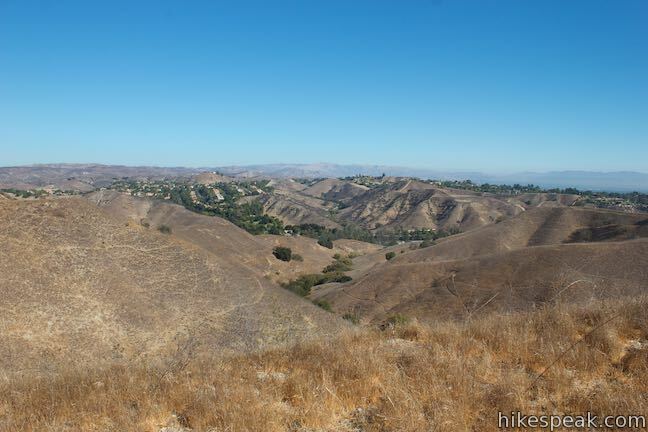 Now 2.75 miles of the hike are behind you. 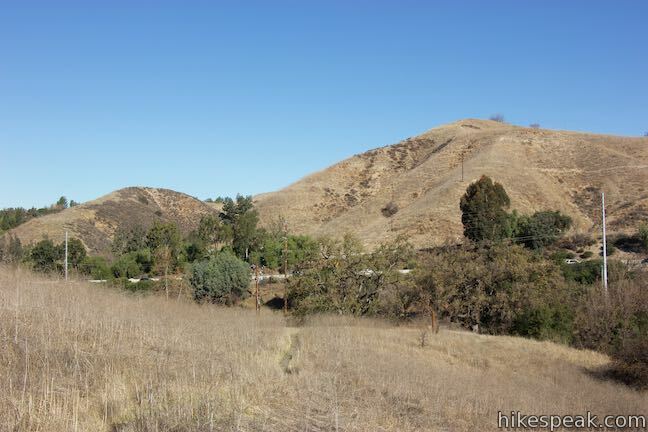 In another eighth of a mile, you’ll stray from the neighborhood and be welcomed into wild, grassy hills. 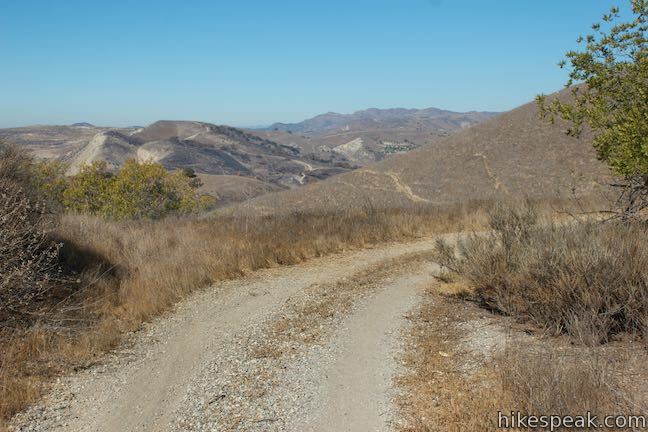 Traveling away from the housing development, the trail remains level for a stretch, offering some big views from the highest parts of the loop at over 1,300 feet of elevation. 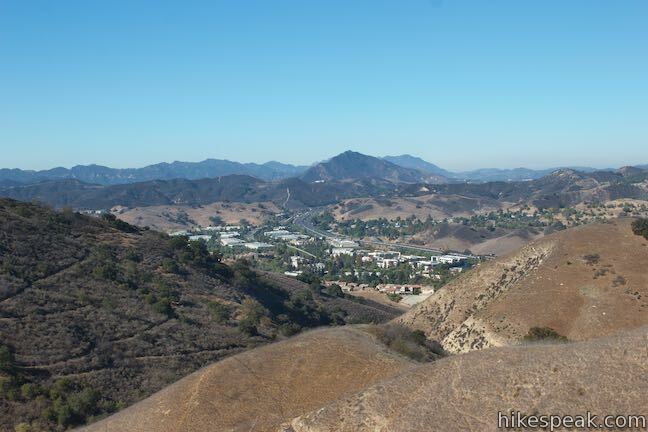 To reward the completion of the first 3 miles of the hike, enjoy excellent perspectives west toward Ladyface Peak and other members of the Santa Monica Mountains. 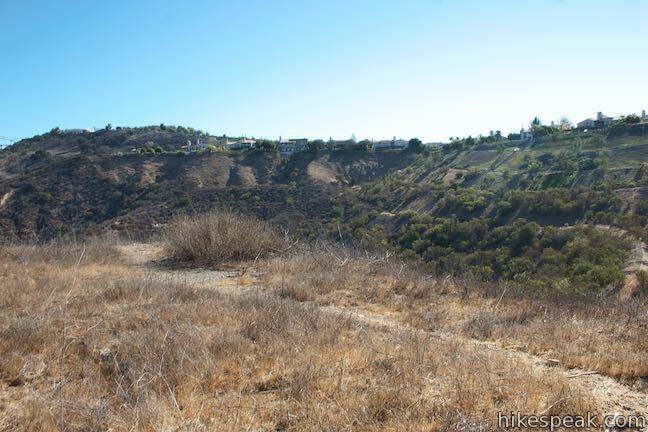 The community of Lost Hills is cradled below. 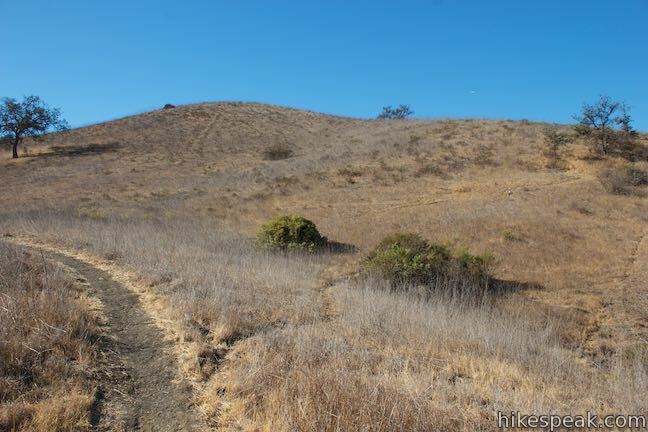 Tipping downhill, the trail makes its way around a grassy ridge. Come to a marked junction where a single track parts to the left. Stay to the right down the wide trail. In another 0.15 miles, come around a bend to the left with another marked junction. 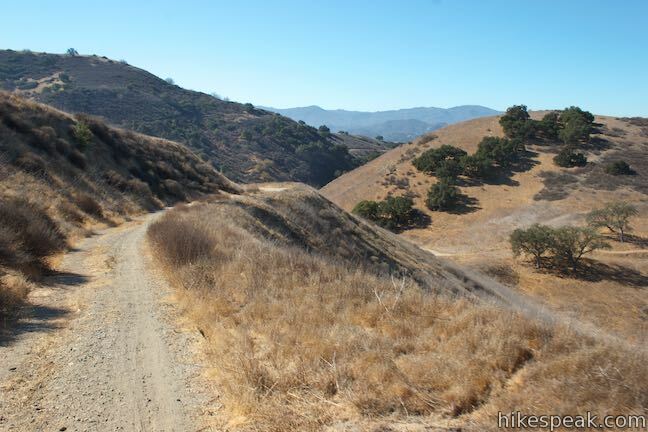 This time turn right up the single-track trail, leaving the wider trail. 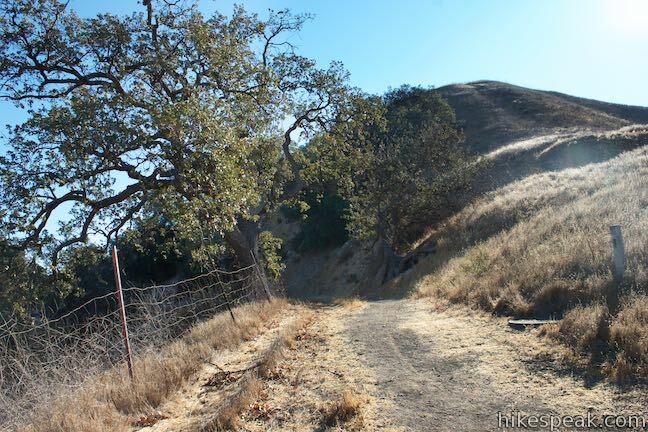 Pass between a few oaks to ease across a ridge. 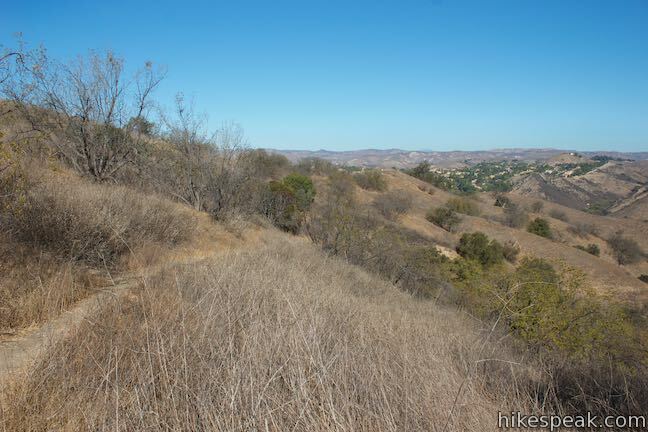 As the trail plunges down the other side, the views open up looking out over the grassy ridges where the hike began. 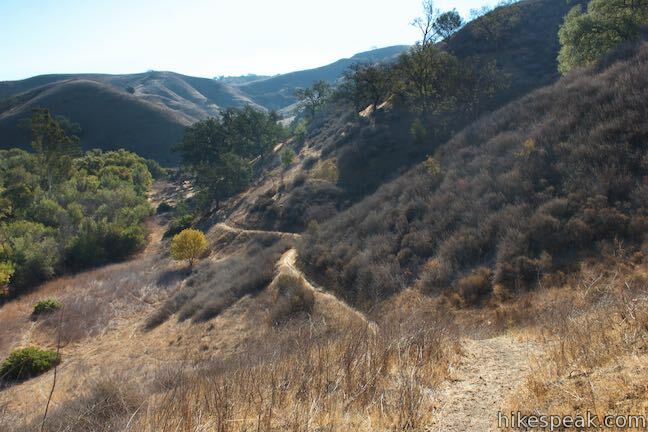 Drop through some tight switchbacks to meet the wide trail. 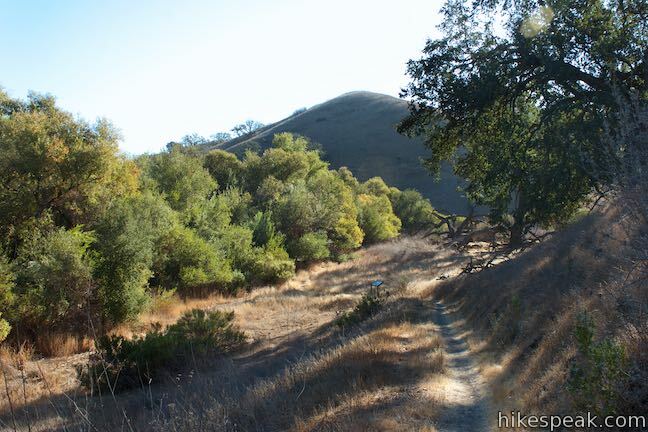 Having hiked the full loop, bear left to make your way back to Juan Buatista de Anza West Trailhead to complete the 4.5-mile hike. 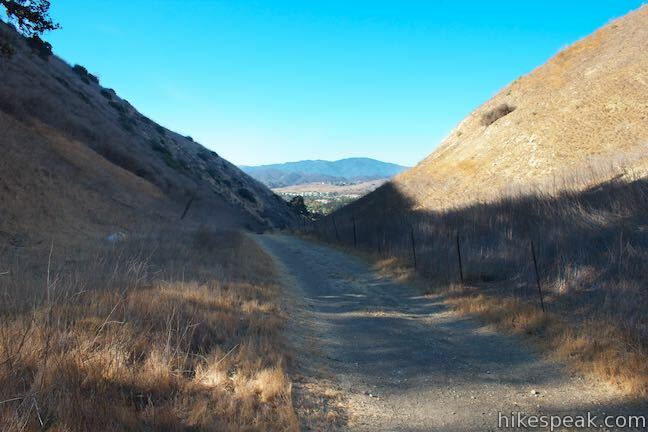 For the shorter version of this hike, start from Juan Bautista de Anza East Trailhead on Calabasas Road. 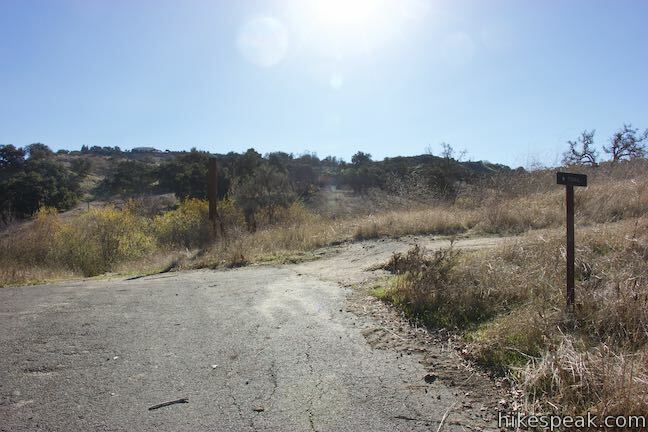 Walk up from the end of the road to find the southbound start of the loop. 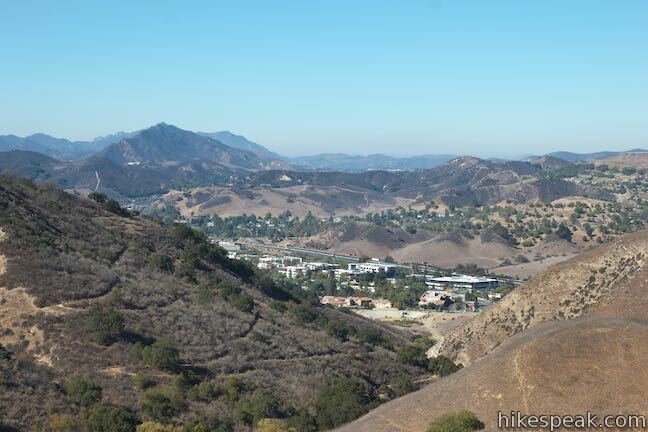 Hike past the Calabasas Stairs and the neighborhood above. 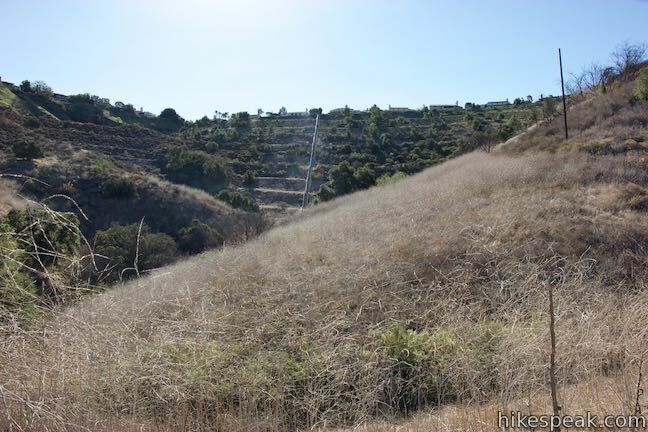 Then explore the grassy ridges on the west side of the loop. 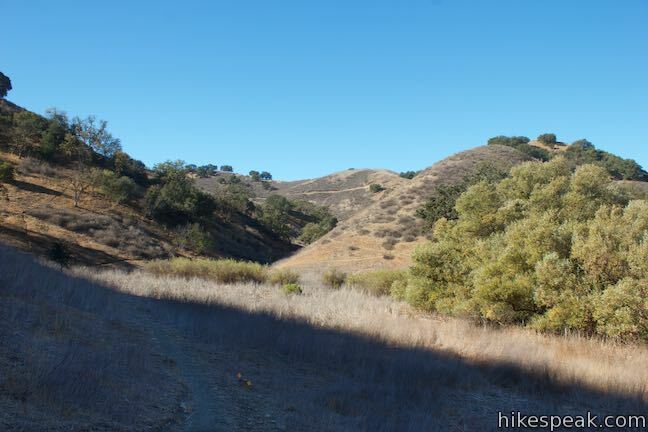 After putting in 2.65 miles of hiking, hit the junction near Juan Bautista de Anza West Trailhead. 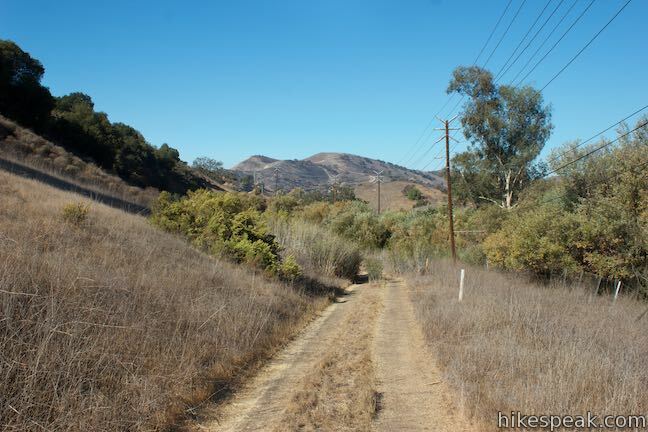 At that point, just turn right (away from the bench) and follow Anza Loop Trail for 1.15 miles back to Calabasas Road. 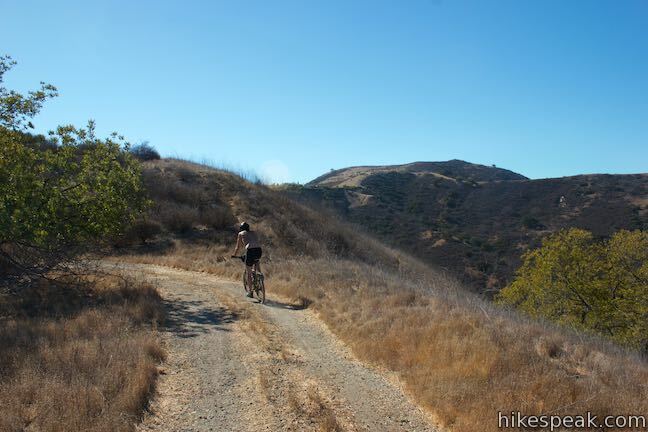 Anza Loop Trail is dog-friendly, but bikes are not allowed. 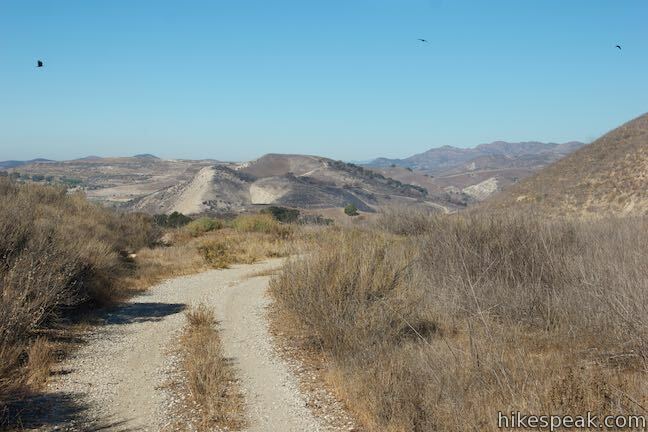 Parts of Anza Loop Trail overlap the longer New Millennium Loop Trail. 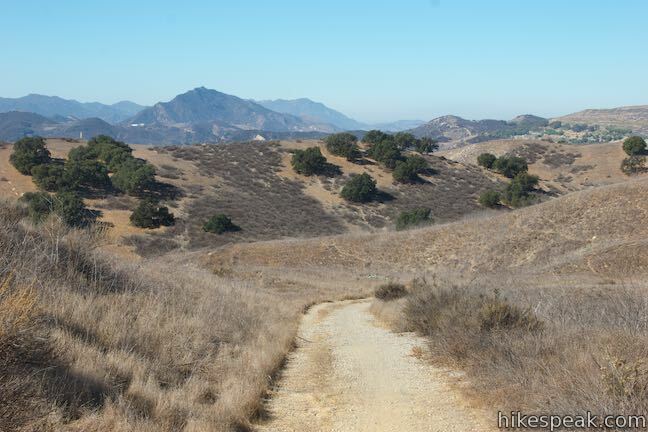 No permit is required for this hike in Santa Monica Mountains Conservancy Zone Parkland. 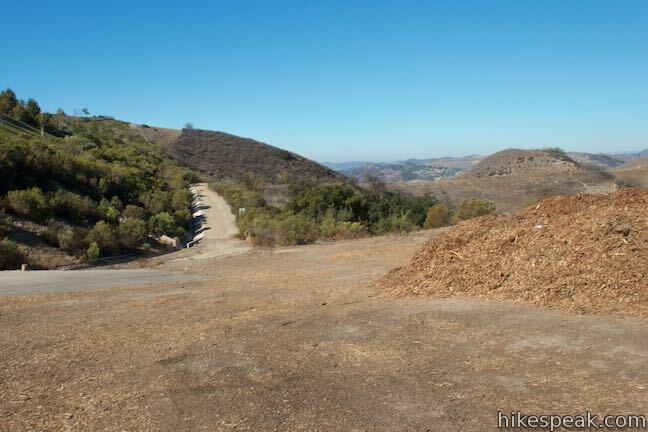 Parking at both trailheads is free, so get out and enjoy! 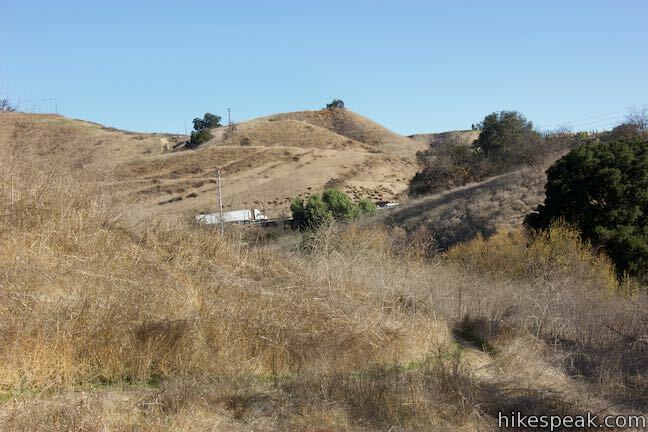 Woolsey Fire Update (December 2018): Areas of Anza Loop Trail were burned by the November 2018 Woolsey Fire, with damage visible from the 101 Freeway. 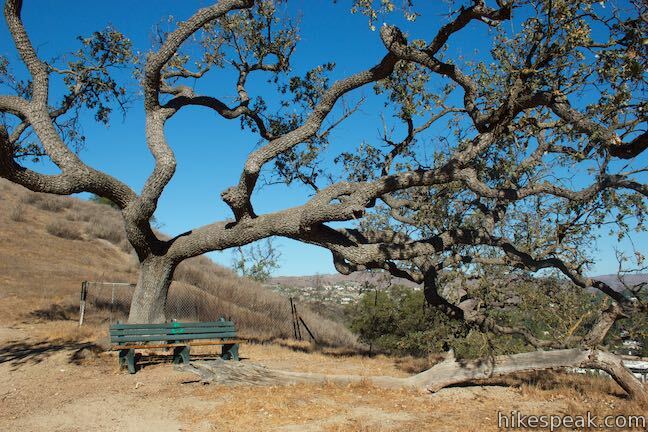 Las Virgenes View Park has reopened. Check the MRCA website for current visitor information for this parkland, managed by the Mountains Recreation and Conservation Authority. 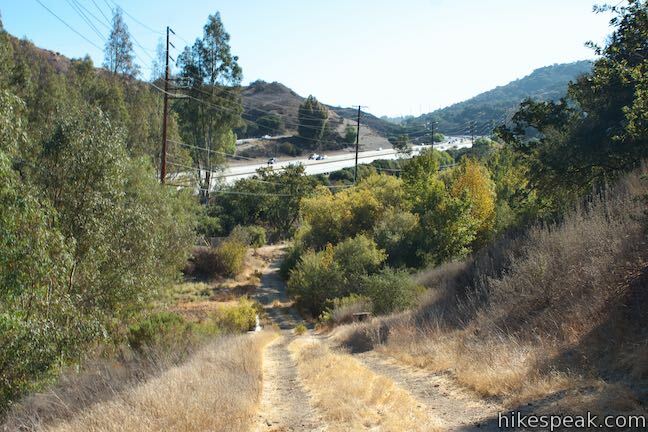 To get to Juan Bautista de Anza East Trailhead: From Los Angeles and the San Fernando Valley, go west on the 101 Freeway North to exit 30 for Calabasas Parkway. 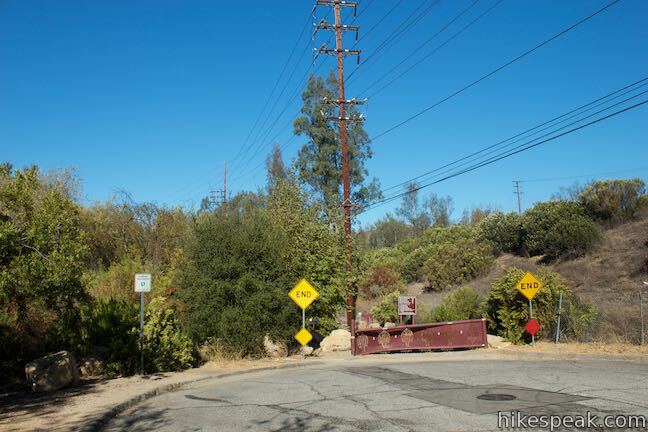 At the end of the offramp, bear left onto Ventura Boulevard. 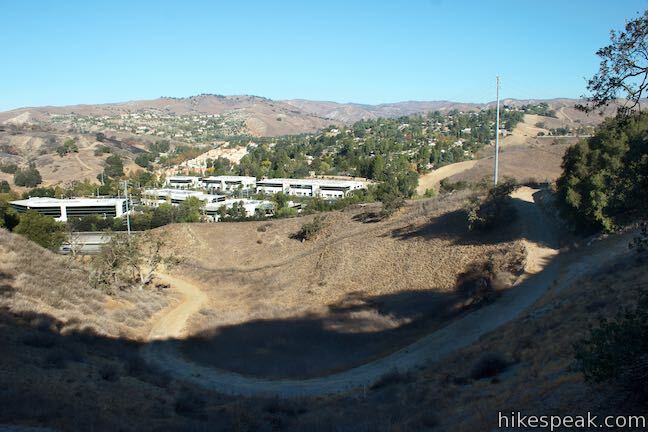 Make an immediate left onto Parkway Calabasas. 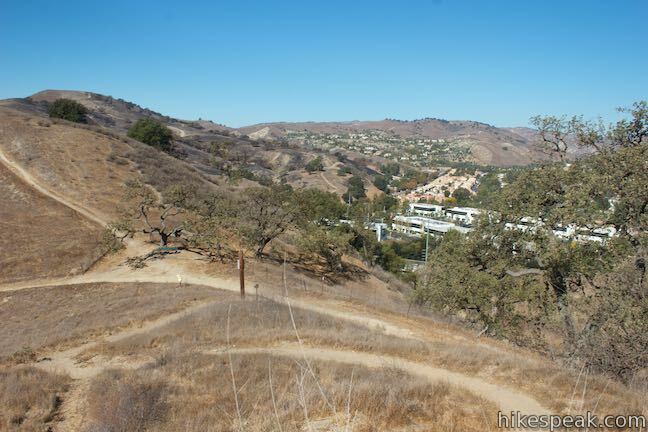 Cross over the freeway and turn right on Calabasas Road. Drive 1.5 miles down this road to the trailhead on the left, just before the end of the road. 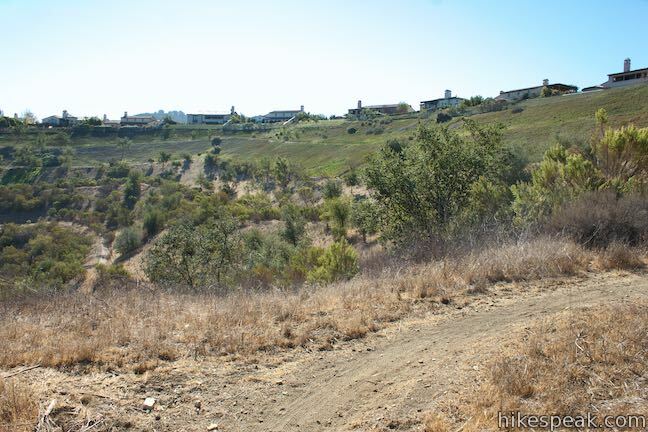 Halfway down Calabasas Road, you’ll need to bear left past Mureau Road to stay committed to Calabasas Road. 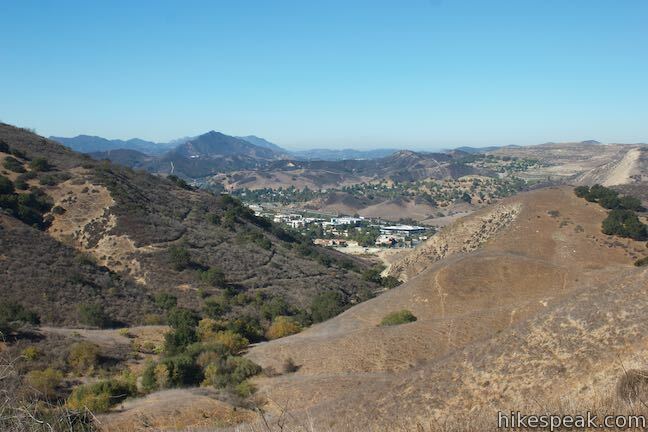 Coming from the Conejo Valley, go east on the 101 Freeway South to exit 30 for Calabasas Parkway. Bear left at the end of the offramp onto Calabasas Road. 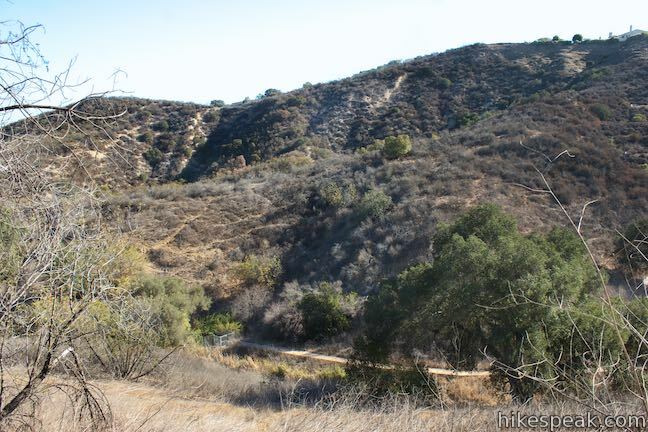 Drive 1.2 miles west on Calabasas Road to the trailhead. 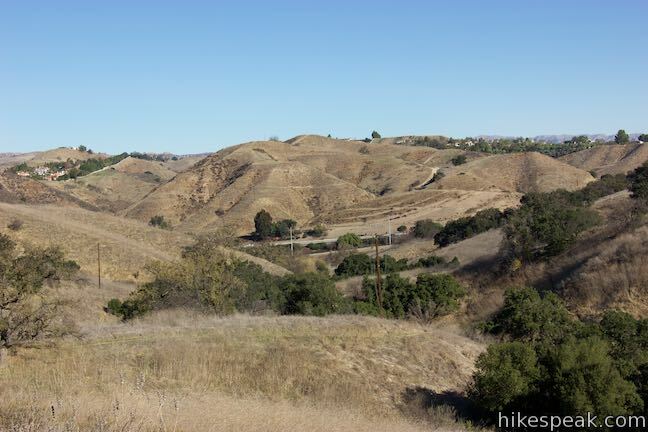 To get to Juan Bautista de Anza West Trailhead: From the San Fernando Valley, travel west on the 101 Freeway North to exit 32 for Las Virgenes Road. 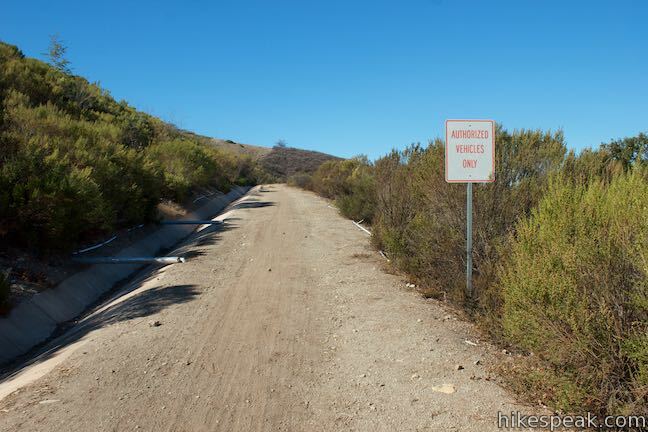 At the end of the offramp, turn left and cross over the freeway, heading south. Drive a quarter mile to the first intersection, which has a traffic light. Turn left up a paved road in front of the Mobile gas station. Some parking is available here. The pavement ends after less than a tenth of a mile as the road splits. 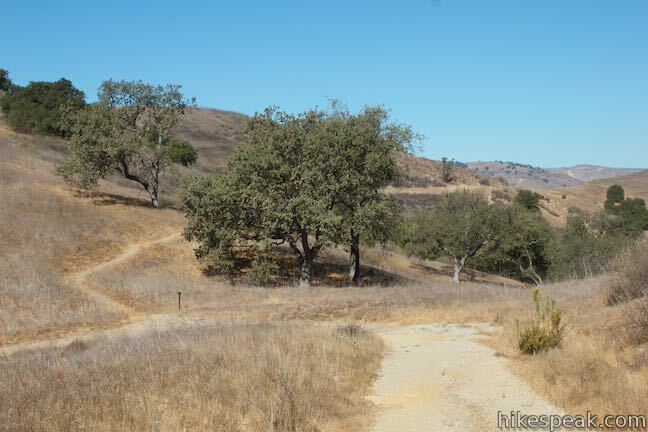 Turn right up the dirt road that leads east, away from Las Virgenes Road. 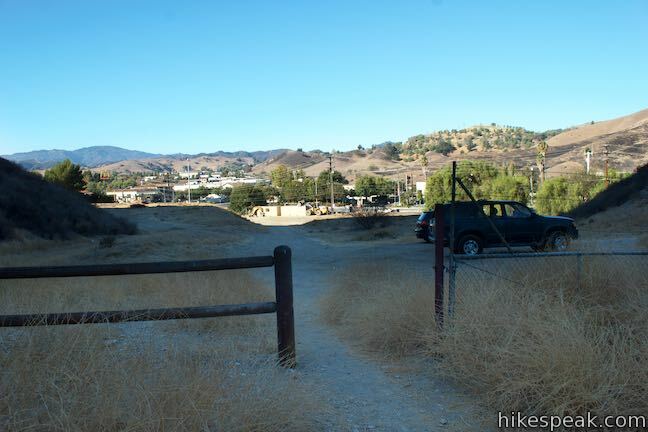 Drive up to the trailhead where additional parking is available. 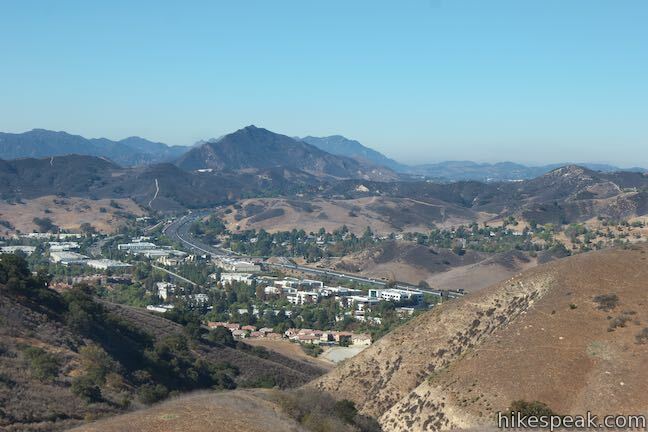 Coming from the Conejo Valley, travel east on the 101 Freeway South to exit 32 for Las Virgenes Road. 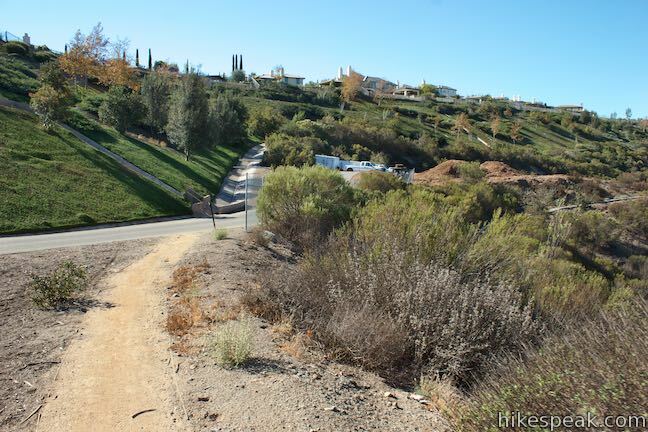 At the end of the offramp, drive straight across Las Virgenes Road up a paved trail to the left of the gas station. 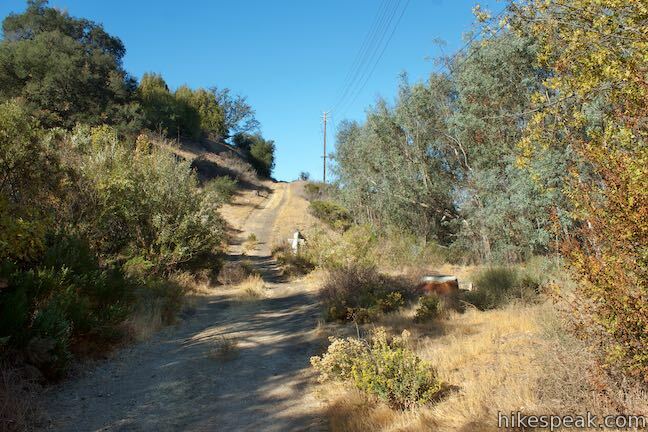 When the pavement ends, bear right at the split to go east up a short dirt road to the trailhead. Taking mass transit? 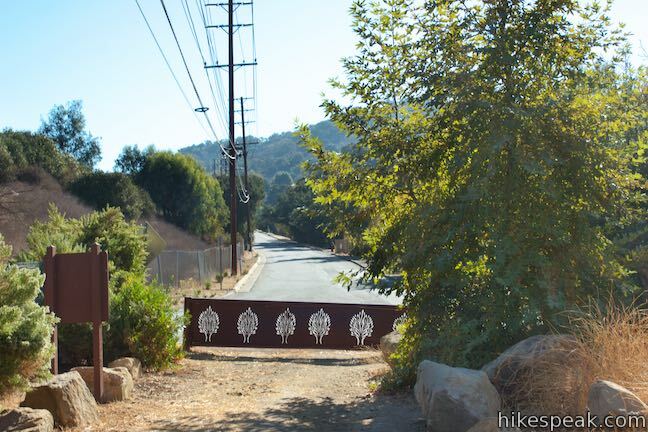 A bus stop used by LA Metro Bus 161 and LADOT Transit Commuter Express 423 is located on the west side of Las Virgenes Road right next to the trailhead. It doesn’t get much more convenient than that!